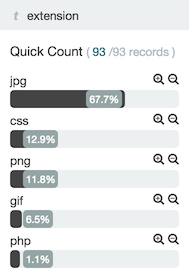 The histogram lists the time range you’re currently exploring, as well as the intervals that range is currently using. To change the intervals, click the link and select an interval from the drop-down. The default behavior automatically sets an interval based on the time range. When you submit a search request, the indices that match the currently-selected index pattern are searched. The current index pattern is shown below the search field. To change which indices you are searching, click the name of the current index pattern to display a list of the configured index patterns and select a different index pattern. You can configure a refresh interval to automatically refresh the page with the latest index data. This periodically resubmits the search query. When auto-refresh is enabled, Kibana’s top bar displays a pause button and the auto-refresh interval: . Click the Pause button to pause auto-refresh. You can add filters from the Fields list or from the Documents table. When you add a filter, it is displayed in the filter bar below the search query. From the filter bar, you can enable or disable a filter, invert the filter (change it from a positive filter to a negative filter and vice-versa), toggle the filter on or off, or remove it entirely. Click the small left-facing arrow to the right of the index pattern selection drop-down to collapse the Fields list. Click this icon to disable the filter without removing it. You can enable the filter again later by clicking the icon again. Disabled filters display a striped shaded color, green for inclusion filters and red for exclusion filters. Click this icon to pin a filter. Pinned filters persist across Kibana tabs. You can pin filters from the Visualize tab, click on the Discover or Dashboard tabs, and those filters remain in place. NOTE: If you have a pinned filter and you’re not seeing any query results, that your current tab’s index pattern is one that the filter applies to. Click this icon to toggle a filter. By default, filters are inclusion filters, and display in green. Only elements that match the filter are displayed. To change this to an exclusion filters, displaying only elements that don’t match, toggle the filter. Exclusion filters display in red. Click this icon to remove a filter entirely. Click the Done button to update the filter with your changes. To apply any of the filter actions to all the filters currently in place, click the Global Filter Actions button and select an action. To view a document’s field data, click the Expand button to the left of the document’s entry in the first column (the first column is usually Time). 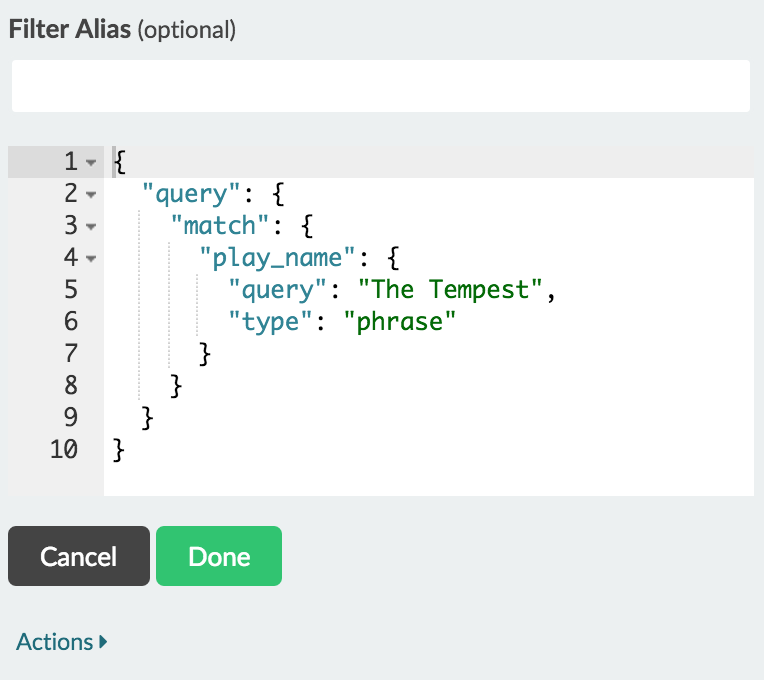 Kibana reads the document data from Elasticsearch and displays the document fields in a table. The table contains a row for each field that contains the name of the field, add filter buttons, and the field value. To toggle a particular field’s column in the Documents table, click the Toggle column in table button. By default, the Documents table shows the localized version of the time field specified in the selected index pattern and the document _source. You can add fields to the table from the Fields list or from a document’s expanded view. Alternately, add a field column directly from a document’s expanded view by clicking the Toggle column in table button.